「Musical Kuroshitsuji -The Most Beautiful DEATH in The World」. 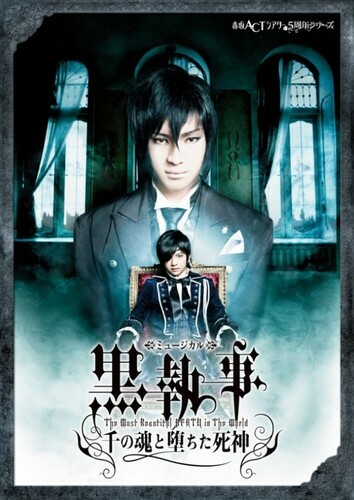 Musical Kuroshitsuji -The Most Beautiful DEATH in The World- Sen no Tamashii to Ochita Shinigami Poster. HD Wallpaper and background images in the Kuroshitsuji club tagged: kuroshitsuji ciel black butler sebastian musical yuya matsushita taketo tanaka 2013. This Kuroshitsuji photo contains anime, komik, manga, kartun, and buku komik. There might also be tanda, poster, teks, papan hitam, and chalkboard.